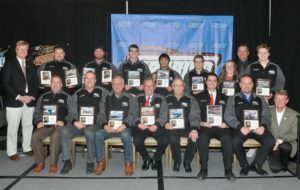 The Awards Banquet helped close out Firebird’s 2018 Drag Racing Season. The event was staged in the beautiful Ballroom of The Riverside Hotel in Boise. The 2018 Track Champions in the Boise Muffler Gold Cup Series included: John Burchtorf (Super Pro), Levi Burlile (Pro), Joseph Johnson (Sportsman), Zak Pedraza (Sled/Bike) and Ty Sasser (Junior Dragster). Peyton Stocker (High School), Mike Ritz (Alumni), Ryan Resinkin (Street Truck), David Meimann (Outlaw Street), Glen Phillips (Super Shifter), Michael Clement (Factory Muscle), Greg Buckert (Nostalgia), Matt Giusti (Street Bike) and Grady Halverson (Jr. Street) earned year-end titles, too. Additional championship titles were handed out to: Middleton High (High School team), Kuna Knuckle Draggers (Silver Cup – Club), The Barons (Bronze Cup – Club), and 3800 Club (Copper Cup – Club). 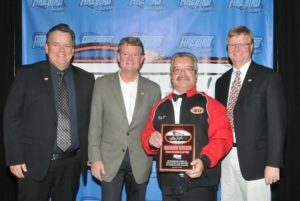 The New family recognized beloved announcer Steve Wong for the 33rd presentation of the prestigious Racemaster award. As the final presentation of the evening, Wong received a standing ovation from the near capacity turnout. One of the premiere announcers in our sport, Stevie was quite taken in receiving the very special honor. Other special award winners included: Burlile (Racer of the Year), Kristi Shawver (Top Lady Driver of the Year), Sam Northup (Most Improved), Amber Rush (Outstanding Perseverance), Burchtorf (Rookie), Mike Coltrin (Best Appearing Race Car), the Sasser Family (Outstanding Crew), Steve Spoor (Official of the Year), Sandy Berry (Firebird Staff Member of the Year) and Brad Pattan (Perfect Light .000 Treasure Chest prize basket-drawing). Photo credit: Gary Himes and Alex Charlton.